What is an Entrepreneur Incubator? – The Moser Group Inc. Shared office space is getting a lot of buzz right now, but another option for entrepreneurs who want a flexible alternative is ‘entrepreneur incubator’ spaces. This type of space allows for any number of small businesses that may have a handful of employees including real estate agencies, car detailing, sign companies, hair stylists, and many others. 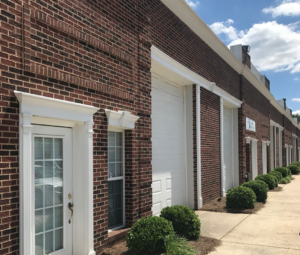 Designed with a brick exterior and professional detailing with surface parking, these spaces can accommodate businesses with frequent visitors and still allow a warehouse/storage/gallery component without a large footprint. The Moser Group has developed several of these spaces in Union County and is currently developing the newest ones in Sun Valley Business Park and Idlewild Commons. Let us know if this sounds like a good fit for your company.